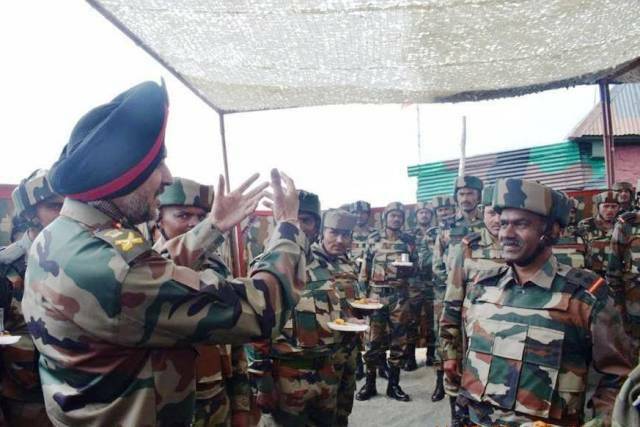 Srinagar, July 11, (Scoop News)- On the final day of his visit, the Northern Army Commander Lt Gen Ranbir Singh visited the forward areas of Kashmir Valley to review the prevailing security situation and strategy for counter infiltration and counter terrorist operations. Accompanied by the Chinar Corps Commander Lt Gen AK Bhatt, the Army Commander visited forward posts in the frontier district of Kupwara wherein he was briefed on the counter infiltration grid and operational preparedness of the formations. The Army Commander was appreciative of the measures and Standard Operating Procedures instituted by the units and formations to meet the challenges posed by the inimical elements. During his interaction with the soldiers on ground, the Army Commander lauded them for their high levels of morale and round the clock vigil which they maintain to thwart infiltration bids by the terrorists. The Army Commander exhorted them to continue to work with same zeal and dedication to defeat enemy’s hostile designs. He also lauded the excellent synergy amongst all the security forces and agencies, be it along the Line of Control or in the hinterland to meet prevailing and emerging security challenges so as to maintain a safe, secure and peaceful environment for the Awaam of Kashmir.